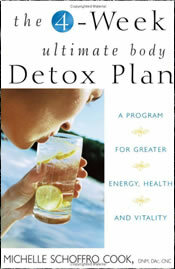 The 4-Week Ultimate Body Detox Plan was created by holistic nutritionist Michelle Schoffro Cook. Her program uses many forms of natural therapies to restore your body’s functioning including nutrition, herbal medicine, exercise, acupressure, meditation and massage. Cook states that the four-week program is designed to provide a thorough cleansing that is much deeper than many of the other detox programs currently available. You will systematically cleanse the various organs and systems of the body in a specific order that Cook says will produce the best results. The basic dietary structure is similar for all the phases with the major difference being that specific herbal teas and special foods are recommended to affect the target organs. For example, in phase one, where the focus is on the kidneys, you will drink cranberry juice, dandelion tea and buchu tea. You will also eat one or two organic apples each day. Throughout the program each morning starts with fresh lemon juice in warm water and a fiber supplement. From breakfast until noon dieters are encouraged to limit their intake of food to fresh juices, fruits and fruit smoothies. Lunch should consist of a large salad with an emphasis on leafy green vegetables. Dinner will also include a salad as well as other dishes such as soups and vegetarian main dishes. Recipes are also included for healthy desserts. Certain foods are to be strictly eliminated such as caffeine, alcohol, sugar, wheat, processed foods, fried foods, salt, meat and dairy products. Organic eggs are the only animal product allowed however their consumption should be limited to three per week. Dieters are encouraged to drink lots of water. The nutritional supplement, Cellfood, is to be added to three cups each day. Cook says that Cellfood is an essential aspect of the program because it helps to flush out the toxins that are stirred up and eliminated from the fat stores and internal organs of the body. Cook also recommends the use of a multivitamin and mineral, digestive enzymes, acidophilus and a green food supplement daily. Almonds, apple, artichoke, avocado, banana, beets, blueberries, cabbage, carrots, celery, cherries, cranberries, flaxseeds, garlic, grapefruit, kale, legumes, lemons, olive oil, onions, raspberries, seaweed, spinach, watercress, watermelon. 1 teaspoon psyllium husks and 1 teaspoon pectin in 1 ½ cups water or unsweetened juice. Cook recommends exercising on a rebounder because this increases the lymphatic flow by up to fourteen times normal. Thirty minutes of brisk walking is also recommended five days a week. The 4-Week Ultimate Body Detox Plan retails at $16.95. Encourages the intake of a wide variety of whole foods and a high amount of fresh fruits and vegetables. Includes unique information about the use of herbs and acupressure. May help to reduce cellulite. Acknowledges the role of stress management and psychological factors in health recovery. Highly restrictive and will be very difficult to eat out. Many dieters will experience fatigue and discomfort due to withdrawal from caffeine, animal products and sugar, especially in the first week of the diet. Some dieters may experience digestive disturbance due to the sudden increase in fiber from supplements, fruit, vegetables, whole grains and beans. Does not include a meal plan. Is not designed specifically for weight loss. Requires the use of nutritional supplements, which may be quite expensive. This program will most appeal to dieters who are interested in a holistic approach to detox due to the inclusion of unique information regarding the use of herbs, acupressure and lymphatic cleansing. However, unfortunately the lack of clear guidance or a structured meal plan may result in suboptimal results for dieters who lack the knowledge to ensure that the diet is nutritionally balanced. I agree with the comments above. This is an excellent detox that I did with success 5 years ago and am now in the first week of it again, and it is going very well. The problem with the plan is that it is not very organized and the reader really needs to pay attention to all the details that are spread throughout the chapters. Also, there is no meal plan, which can be very challenging to some, but if you keep it simple, then you won’t have many issues. Supplements and basic supplies (organic pure unsweetened cranberry…very expensive, cell food, even more expensive) of whole foods can cost about $250, but after that it is quite inexpensive as the diet consists of only fresh fruit, veggies, grains and legumes. It is very restrictive, but hey, it’s a detox, what do you expect? All I know is that my digestive tract was transformed after the first time I did this plan, so I would highly recommend this to everyone. I was going to wish you luck but see from the date that I am too late. How did it go? Would you reccomend it? Any tips? how many weight will lose on dis diet?